Published November 7, 2014 By Leisa Good This post may contain affiliate links. Regardless, I only recommend sites I've researched and/or used and trust. Do you enjoy using social media? Do you enjoy the exchanges that happen in social media? 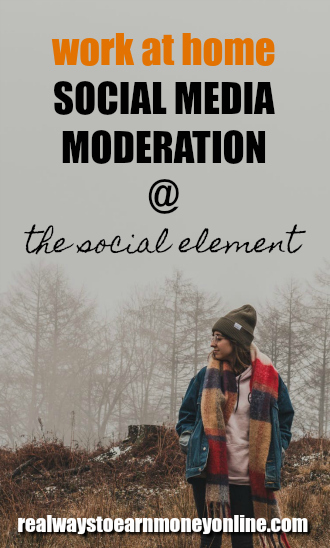 Do you believe that you would be a good moderator for someone’s brand? Then The Social Element might be the right work at home job for you. What Exactly Is The Social Element? The Social Elementis a work at home company that pays workers to moderate clients’ social media presence, i.e., their Facebook, Twitter, Google+, YouTube, Pinterest, Instagram and Vine accounts. Moderation is offered in 50 different languages 24/7. Content moderation serves several purposes while protecting the brand from defamatory libelous language or any obscene content. Founded in 2002 in London by Tamara Littleton, The Social Element has grown to be one of the most respected social media management agencies. Their stellar list of clients includes such names as MTV, Hyundai, BBC Worldwide, and Sony Mobile to name a few. While The Social Element does have a presence on all the social media networks — as you would imagine — they also have their own YouTube channel where they post updated company information as well as their favorite ads. This is a great place to go and learn more about the company and social media in general. What Will You Be Doing at The Social Element? Again, you will be moderating clients’ social media accounts and also creating reports for the clients. You will be trained as to how they want this done. Training is done via the Moderation Gateway system. The computer requirements will be discussed with you during the interview should The Social Element become interested in your resume. However, that said, the basics still apply. You will need an updated laptop or PC with updated virus and malware protection. What Special Skills Do You Need to Work at The Social Element? The skills for The Social Element are to be fluent in the language that you are applying as well as have a good to above-average knowledge of social media. Are You an Independent Contractor or an Employee at The Social Element? You are an independent contractor and responsible for your own taxes. Should you make over $600 a year, you will need to report your earnings. Independent contractors are hired both from the United Kingdom as well as from the United States. What Are the Pay and Hours at The Social Element? The pay is monthly and it varies by the hours, experience, and position. The compensation does appear to be competitive even on a global scale. What Do Others Say About The Social Element? Overall, good reviews received with a 4.1 out of 5.0. Someone did complain that they had over hired and then laid off several workers. One person complained about never receiving his pay, but the rest of the reviews from both employees and independent contractors were good. How Can Interested Individuals Apply to The Social Element? Go here to view the available listings. You will be contacted if a relevant opportunity arises. Good luck to all who apply. Lisa (or Anna) do you know of anyone that has actually taken the Moderation Gateway training? It would be helpful to know if it really helped in finding a job. I have seen that ICUC and eModeration (if I’m remembering correctly) both will consider workers who have been through this course. Just sent my resume in – thanks!